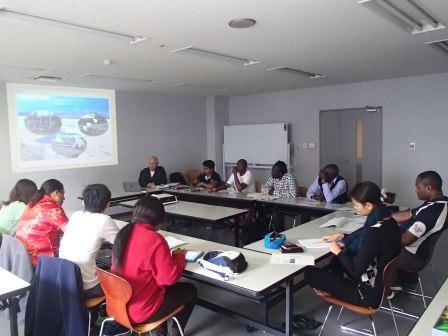 From September 7 to October 12, 2015, KIWC ran a training program under commission from the JICA Hokkaido International Center (Obihiro). The aim of this training was to provide insight into eco-tourism programs involving local residents as a tool for the conservation and sustainable use of local natural and cultural resources. Ten government administrative officials and NGO staff members involved in tourism promotion and wildlife protection from nine countries attended this training program. Countries represented were Cambodia, Fiji, Gabon, Lesotho, Papua New Guinea, the Solomon Islands, Sri Lanka, Vietnam and Zimbabwe. 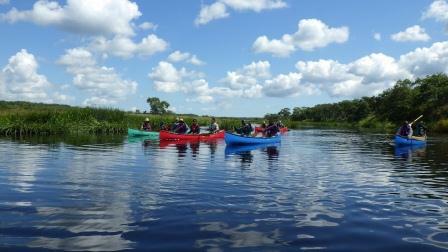 The trainees experienced eco-tours involving local residents that take local environments and wildlife into consideration at Lake Shikaribetsu, Shimizu Town and Kushiro wetlands (specifically Kiritappu-shitsugen, Akkeshi-ko and Bekambeushi-shitsugen and Kushiro-shitsugen). There, they witnessed examples of sightseeing tours operated by local residents that take advantage of local industries, such as agriculture, livestock farming and fisheries. The trainees then traveled from Hokkaido to Tokyo, Chiba and Kyoto to attend programs allowing them to gain insight into the perspective of eco-tourism from certain aspects of Japanese history and culture, including Japanese traditional way of life, historic sites and satoyama (Japanese countryside landscape). They were also given presentations on eco-tourism theories and policies. Trainees also visited Okinawa, where they participated in sea kayaking and other programs to learn how local people utilize eco-tourism with their viewpoints and experiences. The trainees expressed satisfaction with their experiences in Japan, describing Japan was a wonderful country and they had a valuable opportunity, before returning to their countries.